Springtime has come early to my textile studio; I have just finished stitching some sprigs of pale blossom for an exhibition in Vancouver. A perfect way to say goodbye to the winter days and welcome the start of spring. In the 1930s the mayors of Kobe and Yokohama gifted 50 cherry trees to Vancouver, the trees were planted at the Japanese cenotaph in memory of the Japanese Canadians who served in the First World War. More trees were planted in the 1950s, today the city streets are lined with beautiful blossom trees during springtime. 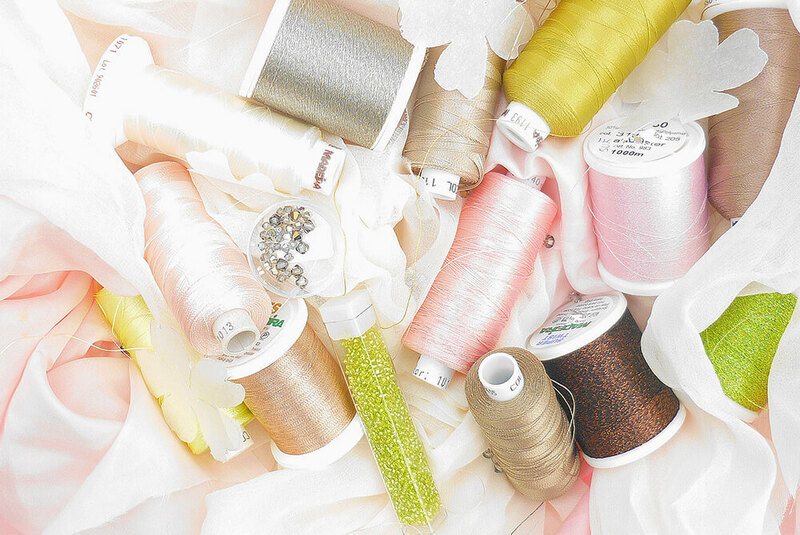 The photographs, right, show a detail of my ‘Blossom’ embroidery, plus the threads, beads and silks used in the work. Although no cherry blossom to gaze at in my winter garden, I did spy the early flowers of another Prunus species. Sketches of these bare branches, studded with petite white and pale pink flowers, sparked an idea for a stitched structure. 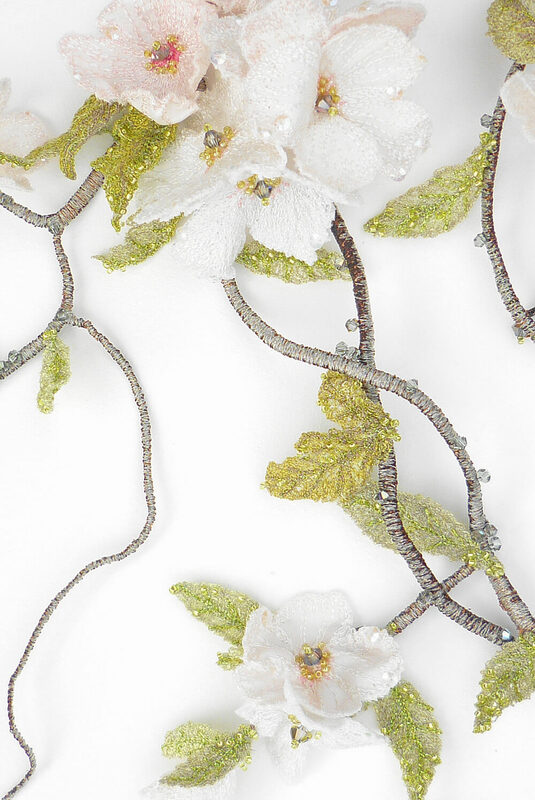 Intertwining branches were interpreted as stitched cords, flower heads created using silk and machine embroidery, and tiny leaves emerged as lace textures. With the finishing touches almost complete, the ‘Blossom’ piece will soon be on the way to the west coast of Canada, I’m excited! Just the last Swarovski crystals to add, and another fuss & fiddle with the silk petals, before it is cocooned in tissue paper. I have been remembering another overseas exhibition, a solo show in Tokyo (1993); during that trip, on a visit to Kyoto, I saw the beautiful cherry blossom trees in the temple gardens. That special memory too has inspired creativity for ‘Cherry Blossom: A Textile Translation’.